Serendipity led me to today's poem. Helene Hanff popped into my head the other day while I was brushing my teeth (I have no idea why). I often think of Mildred Lathbury when I'm cleaning the bath but that's not surprising. However, thinking about Helene Hanff led to thinking about Marks & Co, then to Leo Marks, who was the son of one of the owners. During WWII, Marks worked in the codes section of the SOE & assigned coded poems to agents going on a mission that they would use to send messages back to London. He assigned this poem to Violette Szabo, a young woman who joined SOE after her husband was killed. 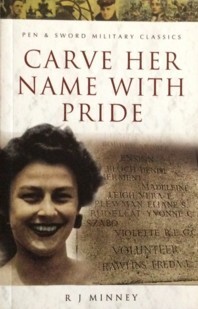 Her story became the book, Carve Her Name With Pride, by R J Minney & a very popular film starring Virginia McKenna. Marks also wrote a memoir, Between Silk and Cyanide, that I remember reading & enjoying in pre-blogging days. The poem, The Life That I Have, has become very popular & is often used as a reading at funerals & memorial services. It wasn't even mentioned in the book & here is a fascinating article about the provenance of the poem. I don't think it matters who wrote it or how it came to be used in the film. It's simple yet very moving, especially in the context of a young woman parachuting into Occupied France, risking her life for her country. Sometimes the simplest words are the most moving. Thanks for sharing the poem, and its enigmatic history - I love the film, but had never thought to look up the background to the code poem. It is beautiful & the story behind the poem is very moving.